Although most engineers are familiar with non-contact laser triangulation sensors, many are not aware of confocal measurement technology and the benefits this measuring principle can offer for both displacement and multi-layer thickness measurement of transparent surfaces. The confocal chromatic measurement principle works by focusing polychromatic white light onto the target surface using a multi-lens optical system. The lenses are arranged in such a way that the white light is dispersed into a monochromatic light by controlled chromatic deviation. A certain deviation is assigned to each wavelength by a factory calibration. Only the wavelength that is exactly focused on the target surface or material is used for the measurement. When selecting a confocal sensor, a number of factors need to be considered. These include the required measurement performance; resolution; the type of material or surface that needs to be measured; measuring speed; the type of environment the sensor must operate in; how restricted or narrow the space the sensor must operate in; and whether you need to measure the thickness of the target or material. Confocal sensors are often selected when laser triangulation or other optical sensors are not accurate or stable enough on the surface being measured. The confocal principle operates using a very small, constant spot size (typically 7-25 micron) through the measuring range, resulting in very stable, nanometre resolution measurements. 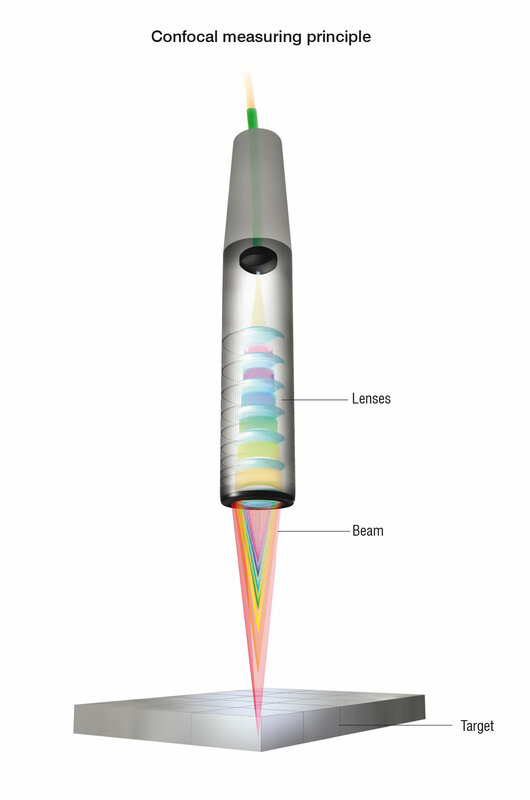 On polished or highly reflective surfaces and even transparent materials, for example, confocal sensors offer greater stability than on dark, diffuse materials – the exact opposite of laser triangulation sensors. In terms of thermal stability, confocal sensors are more stable than laser triangulation or eddy current sensors. This is due to the design of the sensors, which typically comprises a cylindrical tube with a series of optical lenses. The sensor is considered ‘passive’, as the controller and electronics are housed separately and so can be located further away from the target object, which normally means they can be mounted in a more controlled temperature environment. The confocal principle is considered surface-independent, enabling measurements on any type of surface, both diffuse and specular – from dark, diffuse materials to highly reflective, shiny, mirrored or even transparent surfaces. With translucent or transparent materials such as glass, a one-sided thickness measurement can be achieved using a single confocal sensor, along with the distance measurement. Also, because the emitter and receiver on a confocal sensor are arranged in one axis (i.e. the sensor measures vertically down and the beam is reflected back vertically up from the target), shadowing is avoided, which can be an issue if using laser triangulation sensors. If you need to measure inside restricted spaces such as drilled holes, bored holes, cavities or recesses, miniature radial and axial confocal versions are now available. Some confocal sensor suppliers can offer miniature versions with diameters of just 4mm, allowing the sensor to be inserted into very tight or narrow gaps and cavities. As confocal sensors are considered ‘passive’, i.e. do not contain any electrical components, they are suitable for vacuum applications in semiconductor and microelectronics production. In cleanrooms or vacuum environments, specific confocal sensors can be provided to suit either a low level vacuum or an ultra high vacuum with zero outgassing. As there are no electronic components inside the sensor, this means the sensors do not emit any heat radiation during operation, which in turn prevents mechanical expansion of parts inside the sensor or the target being measured. The result is a much more stable, accurate sensor. Confocal sensors are connected to their controller (which houses all the conditioning electronics) via fibre optic cable. Cable runs can be long (up to 30m) with no degradation of the signal. And for vacuum environments, a vacuum feed-through connector is supplied. If you need to measure the displacement, thickness or surface topography of a target material at high speeds, confocal technology is the most suitable optical displacement measurement technology. The latest confocal sensors and controllers from Micro-Epsilon, for example, achieve measurement rates of up to 70kHz using an LED light source integrated into the controller. Various interface options are available with these controllers, including Ethernet, EtherCAT, RS422 and analogue output, allowing the measurement data to be shared in real time with production and quality control systems.